The ECi-2 monitors five key factors in corrosion – linear polarization resistance, open circuit potential, resistivity, chloride ion concentration trend, and temperature. Toward that end, it includes multiple integrated electrodes, directed by an on-board microcontroller, in a molded plastic enclosure. Within a structure, ECi-2 monitors are connected to a multi-drop serial communications network for power and data transmission. Linear Polarization Resistance (LPR) and Open Circuit Potential (OCP): The ECi-2 measures linear polarization resistance by using a steel working electrode, stainless steel counter electrode, and manganese dioxide reference electrode. The working electrode is a sacrificial component made of black steel, designed to corrode at the same rate as the ASTM 615/A-compliant steel that it monitors. Defective areas in protective coatings over structural steel, such as epoxy or stainless steel cladding, may be expected to demonstrate corrosion characteristics comparable with those of black steel. The ECi-2 control module initiates the measurement of open circuit potential between the working and reference electrodes in the potentiostat circuit, and applies the appropriate potentiostat drive potential between the counter and working electrodes. A zero resistance ammeter in the potentiostat circuit measures the cell current. The ECi-2 scans cell current and drive potential over a range about the OCP, and uses the resulting data to calculate polarization resistance. The corrosion rate of reinforcement steel may be expected to be inversely proportional to this figure. If LPR is high and OCP remains small in magnitude, managers may anticipate that the reinforcement steel in a structure is passive, suffering corrosion at a relatively low rate. As steel begins to depassivate, due to an increase in chloride ion concentration trend or other corrosive environmental conditions, LPR will decrease and OCP will become increasingly negative. Resistivity: The ECi-2 uses four stainless steel electrodes to measure resistivity in the concrete that surrounds it. A galvanostat circuit drives a stepped current through the outer pair of these electrodes, and measures the potential between the inner pair at each step. Electronics within the ECi-2 then perform a linear regression to calculate the resistance between the inner pair of electrodes. The ECi-2 multiplies this figure by the cell constant of its resistivity sensor to derive the resistivity of the concrete in units of ohms-cm. This provides information on the relative amount of moisture in the concrete. Structure managers may also use this resistivity parameter with the geometric cell constant of the working, counter, and reference electrodes to correct for ohmic resistance errors in polarization resistance measurements. Chloride Ion Concentration Trend: The ECi-2 uses a silver/silver-chloride ion specific electrode in combination with its reference electrode to measure chloride ion concentration trend. Over time, a potential will develop between the Ag / AgCl and reference electrodes. The magnitude of this potential is related to the chloride concentration in the concrete surrounding the instrument. The ECi-2 reports chloride measurement results as a potential. Temperature: The ECi-2 includes an on-board solid state sensor, which provides information on the temperature within the concrete surrounding it. Microcontroller: An on-board microcontroller sequences all ECi-2 sensor measurements. It also controls sensor drives and data acquisition through digital-to-analog and analog-to-digital converters, and performs all necessary calculations for corrosion measurements. The microcontroller provides power management for the ECi-2 in low power remote installations, such as battery- or solar-powered operations. Toward that end, it can conserve energy by placing various system components into low-power or off modes. Enclosure: The ECi-2 enclosure is engineered to provide environmental and structural protection for its sensors and electronics without compromising the integrity of the structure in which it is embedded. This molded plastic enclosure protects the instrument’s electronics against moisture and chemical encroachment, while providing a rigid base for its electrodes. A flexible waterproof and chemically resistant potting compound is used within the ECi-2 to provide further protection, and to cushion the electronics from external stress on the enclosure. During installation within a structure, a small cage of #3 rebar may be placed around the ECi-2 to further isolate the instrument from mechanical stresses. Such a cage, attached to the structure’s reinforcement mat, may also serve to hold the ECi-2 at an appropriate level for long-term monitoring. Communications and Network Management: Within a structure, ECi-2 instruments are connected to a multi-drop serial communications network. Various network configurations and protocols may be used. The preferred implementation, however, is a local area network using the SDI-12 protocol. Under this protocol, each ECi-2 is connected to a datalogger interface using a three-wire sensor operating at a 1,200 bps data rate. The SDI-12 bus consists of +12 volts, ground, and data lines. Each sensor on the bus is individually addressable. Many dataloggers and sensor manufacturers support the SDI-12 protocol. Within an ECi-2 installation, the data collection system – the datalogger – is located external to the structure under observation, within an environmentally protected enclosure, such as a NEMA-4 box. The datalogger connects to the multi-drop serial communications network cables exiting the structure. It supplies power to the SDI-12 network and to all connected instruments. The datalogger itself may be powered by local electric lines or by a battery recharged by a solar collector. It may be programmed to switch ECI instruments on and off periodically, and to issue commands to collect and transmit data. The datalogger can timestamp all corrosion measurements, and specify the identification number and location of the instrument providing each. It can download these data to a portable computer on-site, or transmit them via wireless transceiver or cellular modem for remote data collection and operation. 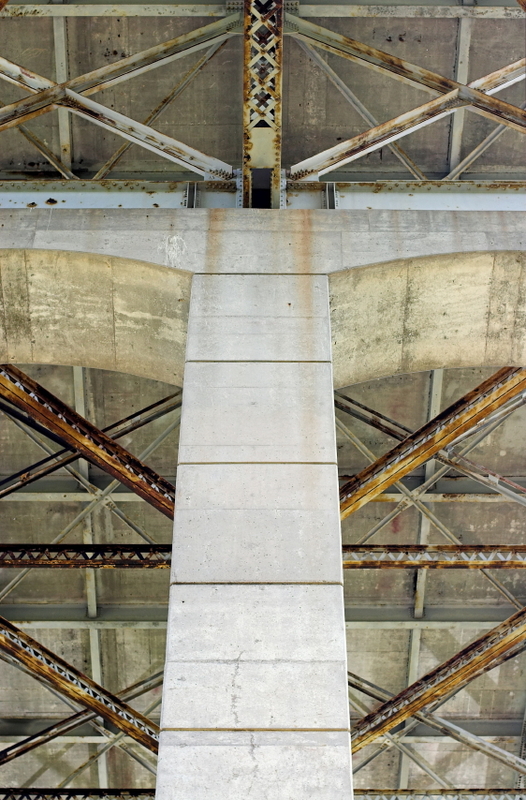 Application: The ECi-2 is used to monitor the corrosion of reinforcement steel in concrete structures, including bridges, buildings, dams, erosion control structures, flood control channels, parking garages, piers, pylons, roadways, and spillways. By way of example, in bridge decks, ECi-2 corrosion monitors are installed within the bridge during constructrion – before the concrete is poured. The instruments are placed with their electrodes facing the top surface of the bridge deck, at the level of the top layer of reinforcement steel. This orientation ensures that the ECi-2’s sensor electrodes encounter the same environmental and corrosion conditions as the reinforcement steel they are monitoring. Once installed, the ECi-2 instruments generate readings on LPR, OCP, resistivity, chloride ion concentration, and temperature within reinforced concrete. These readings can be processed to form a “corrosion map” of a structure. Managers can use this information to determine the location, timing, and type of maintenance that are needed by the structure. By monitoring the corrosive environment within a structure, managers can forecast its remaining life and schedule its remediation or replacement without using costly, time-consuming, and labor-intensive destructive evaluation methods.